Learn the violin using the Suzuki method. I specialize in teaching violin to young students with no experience to beginning and intermediate levels. I strive for greater playing ability in a nurturing environment while always making a beautiful sound. Jared delivers an exceptional lesson experience and ranks in the top 15% of our teachers nationwide. My early childhood music education focuses the student through immersion, encouragement, small steps, and an unforced timetable for learning material based on each student's development and ability to imitate examples and internalize principles. Regular consistent practice is required and parent involvement is encouraged for younger students. Reviewing material, position, intonation, and bow techniques to always make a beautiful sound is of primary importance. Provided group and individual instruction to a wide variety of students in age, experience and backgrounds. --Lead the section over bowings/special techniques/general performance. --Determine divided part assignments, seating, principal solos etc. 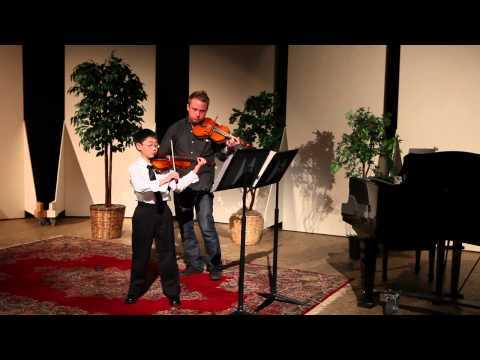 Bach Double Violin Concerto 1st Movement performed with a young violin student.